How do I add a generic link tracking code? » How do I add personalisation to tracking code values? How do I add a Google Analytics tracking code? » How do I customise the Google Analytics tracking values? How do I view Google Analytics reporting within the app? Why does Google Analytics sometimes not correlate with Engagement Cloud's reporting? » Why has Google Analytics stored a higher number of results than the results stored in the Engagement Cloud reporting? » Why has Google Analytics stored a lower number of results than the results stored in the Engagement Cloud reporting? Can I link Google Analytics to more than one website/domain? 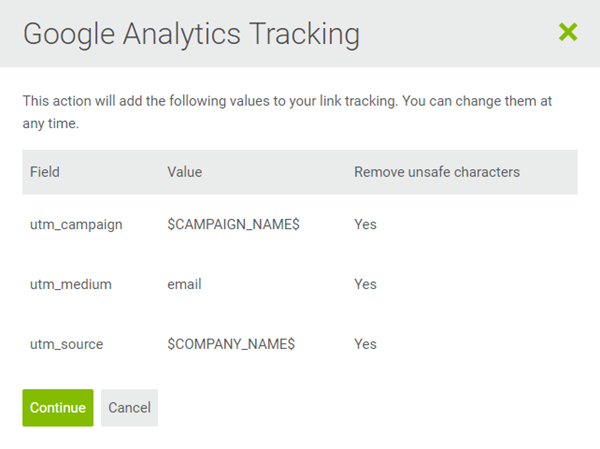 Will the Google Analytics tracking work when it's been set up after the campaign was sent out? How long does it take for Google Analytics to update the data? Can Google Analytics track External Dynamic Content (EDC) links? What causes discrepancies between the Engagement Cloud ROI figure and the Google Analytics ROI figure? Using Google Analytics with Engagement Cloud doesn't have to be a daunting process. This article is designed to be your one stop for using Google Analytics with Engagement Cloud. Link tracking can be custom tracking code, or it can be Google Analytics tracking code, or you can edit and customise Google Analytics tracking values. You can do so via Site analytics, simply by going to Campaigns > Advanced features and then select the Site analytics tab. To add a single generic query string to your outbound links (using analytics other than Google), click Add new under 'Link tracking'. The 'Link tracking' window will open, enabling you to enter the link tracking field and the value you require. How do I add personalisation to tracking code values? To add contact data field personalisation to values, you can do so by clicking on the personalisation icon. Thus, if 'England' is stored against the contact's 'COUNTRY' contact data field, England will be added to the tracking code in place of @COUNTRY@. You may also tick the 'Remove unsafe characters' box. By ticking the box, it will remove characters that are deemed unsafe, so your tracking parameters are not removed by website security profiles. It will then appear under 'Link tracking', which is where all your link tracking query strings will be listed. We recommend making sure that you add names to your links when creating your campaign. This will mean you should be able to find them in your Google Analytics dashboard reports by navigating to Acquisition > Campaigns > All Campaigns, selecting the campaign you're interested in, and then add a 'Secondary dimension' of 'Ad Content'. This will add an 'Ad Content' column that will show all the sessions that came in via those named links. How do I customise the Google Analytics tracking values? If you don't want to use our default values for Google Analytics tracking, you have the ability to customise them by clicking Edit alongside the value you want to change. When checking your campaign reports in the app, you'll also want to see your Google Analytics data in there too, rather than having to also have Google Analytics open alongside your reporting. For your convenience, we've ensured that you can do this. To do this, click the person-and-cog icon on the bottom left corner of the screen, then go to Account > Account settings, scroll down to the 'Google Analytics' section at the foot of the page and click the Authorise connection link. Google Analytics reporting does not always correlate with Engagement Cloud reporting for various reasons; sometimes Engagement Cloud shows higher number of results than Google Analytics, and other times it could be that Google Analytics has stored higher number of results than Engagement Cloud. See below for a brief explanation of why that can occur. Why has Google Analytics stored a higher number of results than the results stored in the Engagement Cloud reporting? Google Analytics defines a session (by default 30 minutes, however subject to alteration by the recipient) as a group of browsing activity meaning if you don’t have any activity for 30 minutes, then start browsing again, it will count as a new session. You can find more information about sessions by visiting this Google Analytics help article. Why has Google Analytics stored a lower number of results than the results stored in the Engagement Cloud reporting? A contact clicks on a link > Engagement Cloud decodes the link and counts it as a click-through on the reporting page > the page doesn't load completely, therefore the Google Analytics tracking query does not fire. The contact closes the browser before the page finishes loading, and therefore the Google Analytics queries are not fired. The web page takes so long to load that the Google Analytics tracking never fires. The contact has already visited the same page recently, so the Google Analytics tracking doesn't fire. Something on the page is throwing an error before the Google Analytics tracking on the page is reached. It is only possible to synchronise your Engagement Cloud account with one Google Analytics account; however, your Google Analytics account can be linked to other separate websites/domains. Google Analytics simply pushes the data back into Engagement Cloud, in which case you select the website from the drop-down list, meaning that the Google Analytics feature in Engagement Cloud will allow you to see data for 'website X' in 'Engagement Cloud account Y' and vice versa. 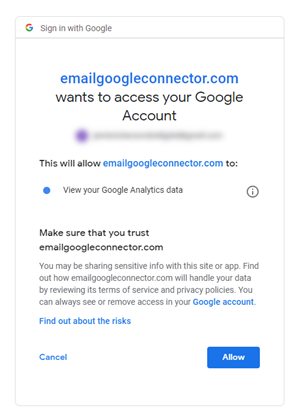 Google Analytics cannot work retroactively, that is the Google Analytics account must be set up and configured before the tracked campaign is sent out. If a triggered campaign has been set up before the Google Analytics configuration, then the triggered campaign needs to be saved for any future sends to be tracked via Google Analytics. Processing latency is 24-48 hours. Standard accounts that send more than 200,000 sessions per day to Analytics will result in the reports being refreshed only once a day. This can delay updates to reports and metrics for up to two days. Yes, Google Analytics can track EDC links, and Engagement Cloud automatically applies UTM variables to links generated via EDC. Engagement Cloud's campaign tracking for ROI expires after one hour, and in contrast, Google Analytics' tracking expires after six months. This can be changed using the _setCampaignCookieTimeout(); further call details can be found in this Google Analytics article. Google watches visitors for far longer than Engagement Cloud does, and the Google revenue number will typically be higher than the Engagement Cloud one over time. Therefore, if a recipient clicks a link in a campaign that takes them to your website, but then decides to make a purchase after 60 plus minutes before the Google tracking expires, they will be tracked by Google as revenue, but not by Engagement Cloud.